Products like sauces, pastes, oils and syrups are widely known for their conventional uses and are often forgotten about, but there is so much more that they can be used for to add on-trend flavour and variety to your menus without having to buy more ingredients. Chefs nowadays are constantly using these products in innovative and versatile ways to not only maximise the flavour of the dishes they are serving, but to also optimise storage space and to manage their costs better. 71% of world food eaters are keen on a wider range of foods from around the world available on menus. Products like sauces, pastes, oils and syrups allow chefs to simply add these flavours from key trends to dishes, without having to buy all the ingredients to make them. They can also help with tailoring your offer to seasonality too, as 63% of consumers want seasonal flavours. In the winter, customers want to see warming flavours on the menu, with things like cinnamon, cloves and pumpkin spice being a big hit at the moment. Whilst in the summer, BBQ flavours continue to be popular. The first thing that comes to mind for most when talking about winter spiced syrup is the coffee specials that millennials are known to love from well-known coffee shops. However, you most definitely shouldn’t limit yourself to using syrup in just coffee. You can use a winter spiced syrup in hot chocolates, and you can use it to add a winter feel to cocktails such as a peach Bellini. Syrup isn’t just used in drinks; chefs are starting to use syrups to add seasonality to dishes that are already on menus, such as a brioche pudding. Simply pouring the syrup in when whisking the egg mix means that the syrup brings out cinnamon and cloves flavours plus a warm and cosy feel to the classic dish in a simple but effective way. Honey & mustard dressing is a basic product that most kitchens will have and is a great way to tailor dishes to the Americas Discovered trend. Although it is mostly used in salad, you can actually use it in lots of different ways. It is great to use as a glaze over chicken wings and you can even mix it with mayonnaise to create a creamy dip for chips and wedges. Another great way to use it is by revamping the classic jacket potato lunchtime option by mixing it with cheese, chives and bacon to add a creamy, sweet and tangy twist to the dish. If you are looking for inspiration and products on the Americas trend to put onto your menu, then our New4You Inspired by Real American guide is perfect for you. Japanese flavours are very popular at the moment, in fact, Japanese food is growing twice the rate of the branded restaurant and contemporary fast-food segment. Teriyaki sauce is one of the most popular Japanese flavours coming through onto menus, due to it being flavoursome and versatile. You can use it to mix with noodles, sesame oil and chopped herbs for a noodle dressing. You can marinade it onto salmon as part of your salad offer. You can also glaze it onto hotdogs to add a fusion to the classic American hot dog with a sweet Asian twist coming from the teriyaki sauce. For more inspiration on Asian flavours, we have our New4You Inspired by Oriental Burst guide which is filled with inspiration and recipes to tap into the trend. One of the hottest emerging trends in the UK at the moment is modern, contemporary Indian flavours. In fact, MCA research indicates contemporary Indian cuisine as one of the top 5 expected fastest growing cuisines in the eating out sector in the next 3-5 years. The authentic, fresh, bold and colourful flavours provide great opportunities for you to add a trendy twist to your menu. One of those ways is through Mughlai butter paste. A couple of ways you can use the paste are: to use as a condiment for steak, to marinade it on lamb before roasting, or you can mix it with lamb mince to make our dirty burger recipe. The recipe is a great way to add an indulgence option to your menu by spreading mango chutney on the bun, adding the Mughlai butter burgers, then topping it with crushed onion bhaji, mixed leaves and a yogurt dressing. My personal favourite! If you are looking for more flavours and inspiration from the modern Indian trend, then take a look at our New4You Inspired by Modern Indian guide which has our range and recipes to support you with getting this exciting trend onto your menu. 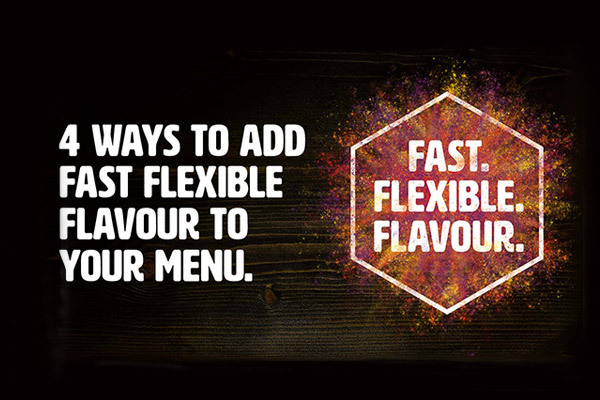 Look out for phase two of the Fast Flexible Flavour campaign, coming soon!